I haven't clicked on the link, but I've heard Palumbo say he likes HGH at the 4-6iu mark. Unless.....you are using exogenous forms of both. So what they are saying here i beleive is that if you are on all day you are causing yourself to become insulin resisitant because your body cant produce thw insulin naturally very good when there is exogenous gh. I honestly think that this .jpg explains the whole process pretty well. As stated in the fine print, without insulin GH loses much (if not all) of its anabolic actions. GH and IGF-1 stimulate protein synthesis directly, while insulin is anabolic through protein breakdown. 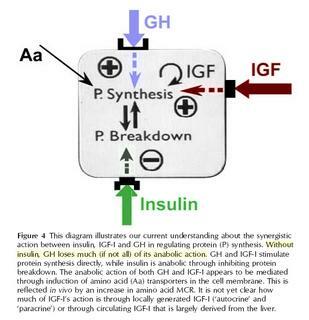 GH and IGF-1 are further mediated by insulins ability to supersaturate the muscle cell with amino acids and glucose. I further found studies that suggest that beta cell breakdown in type II diabetes come long before blood sugar levels start to rise. There are certainly other schools of though on this whole matter who are also "experts" in the field. Ameen Ali suggest using small doses of both, doing the GH about 30 minutes before the insulin so they both peak at the same time in the gym and after meals and Milos Sarcev suggest using large doses of fast acting (10iu) pre-workout, With GH done 2 hours before training. I am 62 year old and have my blood tested all the time. I have used both methods and prefer Milos method. I also used 100g of carbs mixed with leucine for a work out beverage. The last time I had my blood tested I did not use insulin that day, grabbed a Whataburger, fries and a soda on the way because I was suddenly starved to death and my glucose was 97. So I am very reluctant to buy into this beta cell burnout being caused by the high carbs used with fast acting insulin. I further have read studies that show how IGF-1 levels maintain beta bells. What about GH? Clinical studies support the idea that decreased human growth hormone in the adult body plays a major role in bringing on the effects of aging. Thus, the onset of Type II diabetes. Exactly why so many doctors are prescribing GH/testosterone as part of anti-aging therapy maybe combined with Metformin. Note - I do only eat medium carbs regularly (~35-40%) and high protein, mostly low GI. Anyway, good video though I had difficulty getting past her use of make up. The damn painted on eyebrows and lipstick were not to my taste and very distracting. My wife tells me that is the new thing but she honestly looked like the Joker. Anyway, I will pass on this too. There was a doctor that was posting on PM a while back. He was doing some great experiments on peptides by testing his blood. He tested DATbTrue's claims that carbohydrates blunt the GH response of peptides. I argued with DAT many time and alway lsot because it was his kingdom. Anyway, the doctor fasted for 5 hours I believe and drew his blood maybe 30 minutes after using CJC and GHRP. The blood GH levels were way above normal as expected. A week later he at a meal with carbohydrates, he did the same dose of peptides and 30 minutes later drew blood. The blood GH levels were the same. No difference between eating carbs or not eating carbs. More......Dr. Bengtsson's did a study that was the first to show that growth hormone caused increased insulin resistance, however, after 6 months of HGH therapy his patient's insulin sensitivity returned to where it had been before the therapy. This 6 month study showed that growth hormone did not increase the patient's blood glucose or make the patient diabetic. Dr. Bengtsson says that it may very well be that the improvement in the patient's body composition (decrease in fat cells) after 6 months of therapy offset any negative effect that growth hormone may have had on insulin. We do know that low dose Metformin will correct this quickly. Thierry Hertoghe, MD, who specializes in hormone replacement therapy in Brussels believes that human growth hormone helps to promote the action of insulin. He believes that because HGH helps to direct the insulin to put glucose into the muscular cells, cardiac cells, and nerve cells, rather than the fat cells of the body HGH may actually help to improve diabetes. Greg Fahy, Ph.D., of the Naval Medical Research Institute has stated that he may have discovered a method to possibly cure adult-onset diabetes using HGH. He has stated that his own experiments have shown that human growth hormone is very beneficial for diabetes. Again, it back to what I said about GH levels declining as we age. IGF-1 has properties similar to insulin and it has been shown to improve blood sugar profiles in type 2 diabetics. High doses of HGH have been shown to increase insulin resistance, but IGF-1 administration has actually normalized the insulin resistance in a group of volunteers. So as we age GH declines and IGF-1 levels also reduce, thus the onset of insulin resistance and Type II diabetes. Last edited by bigtex; 06-17-2018 at 01:38 PM. I agree. All three work synergistically. Love it with GH but not using gh at this point.